Several car accidents in the state of Nevada, and across the nation, involve non U.S. citizens including undocumented immigrants. When an undocumented immigrant is involved in a car accident, he or she is often afraid of engaging a Nevada personal injury attorney and filing a lawsuit due to fear of being deported back to his or her home country. Many believe that if they sue an at-fault driver or a car insurance company, they will be reported to U.S. Citizen and Immigration Enforcement (USCIS) and immediately be deported. The simple answer is this: Because immigration status is irrelevant to a personal injury lawsuit, it is not appropriate to report immigration status; it is also against court rules to bring this non-relevant information into evidence in the case. In Nevada the attorney for the party seeking compensation from injuries suffered (known as the plaintiff) can file a motion on his or her clients behalf prior to trial, requesting the presiding judge not allow the insurance company’s defense counsel to mention anything regarding immigration status as it is irrelevant to the case at hand. The same is true for other courts across the nation. In short, undocumented immigrants can file a personal injury lawsuit seeking monetary compensation for medical bills, lost wages, as well as pain and suffering and other damages regardless of their current legal status. In fact, you do not need to have a social security number, a driver’s license, nor need to be a citizen or permanent legal resident to be paid compensation for injuries suffered due to another’s negligence. This is because of the U.S. Constitution’s Equal Protection clause in the Fourteenth Amendment. Specifically, it notes that states are forbidden from denying any person of the benefit of jurisdiction under the equal protection of the laws. It is easy to assume that if you are injured by another due to his or her negligence, all of the fault—and in, turn, all of the financial liability—belongs to that person. While this may be true in some Nevada personal injury lawsuits, it is not the case for all of them. A jury may find the injured victim shares some or all of the fault for the harmed suffered or the underlying accident that caused the harm. When this happens, Nevada courts apply what is called shared fault—or modified comparative fault—to calculate monetary compensation due. This rule helps to reduce or even eliminate the damages award due to an injured plaintiff, depending on the facts of the case. Under this rule, a plaintiff may collect a monetary award that is equal to the percentage of which he or she is found to be at fault—as long as that percentage is less than 50%. If the injured party is found to be 50% or more at fault for the resulting harm, he or she may not recover any money from the defendant. If you or someone you care about is an undocumented immigrant who has been hurt in a Nevada accident, know that you have options under the law. 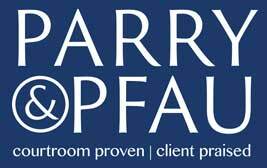 Contact the experienced Nevada personal injury attorneys at Parry & Pfau today to schedule your initial, free, case evaluation.